Large reserves of natural gas were discovered in Bolivia in the late 1990s by foreign investors availing themselves of new operating contracts. Chief amongst the companies concerned were Petrobras of Brazil and Repsol-YPF of Spain. Most of the discoveries so far have been concentrated in the small far-south department of Tarija. Discoveries to date mean that Bolivia now has the largest gas reserves in Latin America outside Venezuela, providing an important potential source of energy to its Southern Cone neighbours and to Brazil. Globally, however, Bolivia's share of world gas reserves is fairly insignificant. In May 2006 the figure stood at 54 trillion cubic feet of proven and provable reserves, with a theoretical market value of US$70 billion. 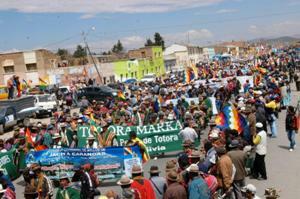 On 1 May 2006 Evo Morales created an international stir by sending in troops to occupy some of the larger gas fields in Bolivia, thereby proclaiming national ownership over the oil and gas industry. Companies that had benefited from privatisation (or 'capitalisation' as the process was known in Bolivia) and the subsequent granting of oil contracts would be obliged to sign new contracts with the Bolivian state, with the proviso that failure to do so would mean expropriation. The hydrocarbons law, passed the previous year, had already proclaimed national ownership of all reserves up until the well-head, in line with a referendum carried out in July 2004 that overwhelmingly endorsed a change of regime. Private oil and gas companies had argued that the hydrocarbons law represented an arbitrary violation of legal security by unilaterally declaring invalid contracts signed with the Bolivian state. The government argued that the original contracts were in any case invalid because they had never received official approval from the Congress, as the law of the time specified that they should. What does the new 2006 law entail? In existence since 1936, Bolivia's state oil and gas company YPFB ( Yacimientos Petrolíferos Fiscales Bolivianos ) became little more than a shell company after capitalisation in 1996 . Since the May 2006 nationalisation, it has recovered many of the key functions that it enjoyed up until its 1996 part-privatisation. The 1 May nationalisation decree gave YPFB 60 days in which to reorganise itself and to assume its responsibilities as the lead institution in the sector. It failed to observe this deadline, and its president was replaced in August 2006, accused of corruption. There are also concerns about its technical capacity to fulfil the new roles. Given its sidelining between 1996 and 2006, it will probably need to continue to co-operate with overseas companies on, for example, research and development and technological issues. PDVSA, the Venezuelan state oil company, has offered technical assistance. The main foreign investors in Bolivia, including British Gas and Total as well as Petrobras and Repsol, were given a 180-day deadline to sign new contracts. This expired at the end of October 2006. Most companies initially responded by announcing their suspension of any new investment in Bolivia; although they have been paying the increased taxes required under the May decree. The Morales government has made clear that the original hydrocarbons sales contracts with Argentina and Brazil did not work to Bolivia's long-term benefit and need to be renegotiated. Argentina, in June 2006, agreed an increase in gas prices from US$3.4 per million BTUs to US$5 and committed itself to substantially increasing its purchases over a 20-year timeframe. Brazil, by far the most important customer for Bolivian gas, has nonetheless made clear its reluctance to reopen its previously negotiated sales contract, which is not due to expire until 2019. Negotiations on this issue with Brazilian state energy company Petrobras on this were postponed until after Brazil's October 2006 presidential elections. Gas nationalisation has proved a very popular policy in Bolivia, where there is a strong perception that for centuries the country has been obliged to sell off its natural resources on disadvantageous terms. The new policy calls for the 'industrialisation' of gas, and its use in developing new industries that will provide Bolivians with much-needed employment. Venezuela has offered Bolivia financial and technical support in developing its gas potential. Foreign investors, while highly critical of both the hydrocarbons law and the May 1 decrees, have adopted a wait-and-see policy. New investments have nonetheless been shelved. The Bolivian hydrocarbons industry was first nationalised in 1936 when, in the wake of the Chaco War, the assets of Standard Oil of New Jersey were taken over to create YPFB. This move predated the Mexican oil nationalisation by two years. The Petroleum Code of 1955 - adopted at the time when the revolutionary MNR government came under severe diplomatic and economic pressure from the United States - envisaged a sort of co-existence between YPFB and foreign oil investors. The 1969 nationalisation of the Bolivian Gulf Oil Company led in 1972 to a new hydrocarbons law that created a virtual state monopoly, with foreign companies limited to exploration and production. As a result of the changes introduced by Sánchez de Lozada in 1996, foreign firms were allowed into all areas of the industry, from exploration to the retailing of gasoline and oil products. The 2006 decrees, therefore, seek to reverse the changes that came about from the 'capitalisation' of YPFB in 1996.